Then there’s Horace Pippin. In 1917, at 29 years old, Pippin joined the New York State 15th National Guard, a segregated unit that became the 369th Infantry Regiment. He quickly rose to rank of corporal. In December 1917 his unit was sent to Brest, France, where he worked on railroad track. They were then sent to the front lines at the Argonne forest. The 369th were the 1st Allied unit to reach the Rhine, the first unit to be under the command of the French, and served the longest. The Germans were so impressed with their bravery in battle, they called them The Hell Fighters. Pippin kept an illustrated journal of his time overseas. In October 1918, a German sniper shot his right shoulder. Although it healed, he could never again raise his arm above shoulder height. After 14 months of service, Pippin was given an honorable discharge. All the men in his regiment received the French Croix de Guerre in 1919, and Pippin applied for and received a Purple Heart in 1945. 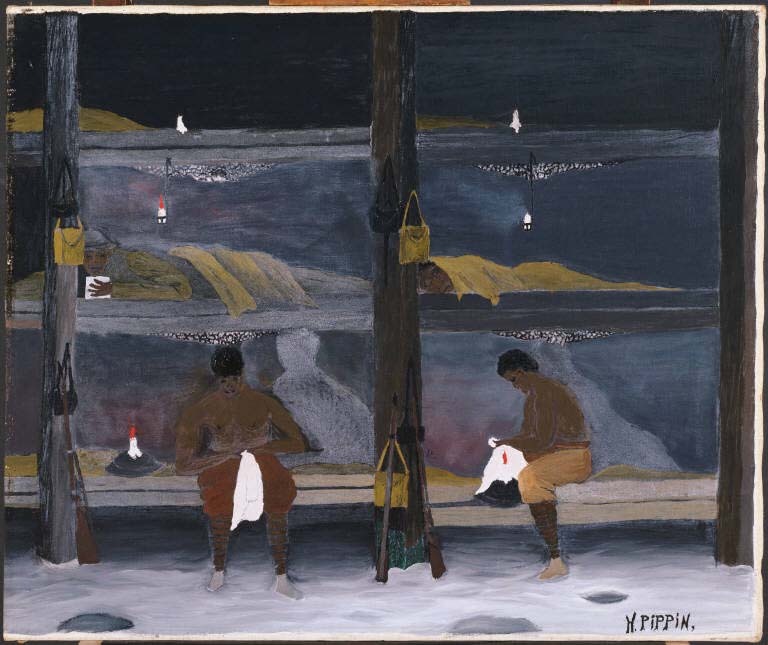 This entry was posted in Experiment Station and tagged armistice, Horace Pippin, Veteran's Day, WWI. Bookmark the permalink.